Sometimes a day can become a little too rainy, too windy, or the sun can become a little too hot and bright, but you still want to be able to enjoy the fresh air of the outdoors. 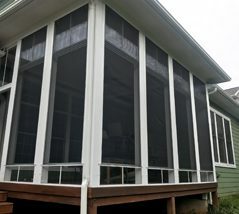 Screened-in porches and shelters allow you to enjoy being outside while staying dry, comfortable, and protected from the sun’s harsh rays when it gets to be a little too much. Another benefit of screened-in porches and shelters is that they enable you to be outside in a private setting – perfect for when you just want be able to enjoy some quiet time in your beautiful yard. Additionally, if you are entertaining outdoors, a screened-in porch or shelter will keep pesky critters away from you and your guests. There’s nothing more welcoming than a beautiful porch. But traditional porch designs are just the beginning. 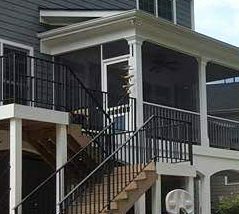 Our porch builders have tons of ideas to help you get the most out of your addition. Whether you choose a porch that’s screened-in or covered, you’ll love the look—and the space—it adds to your home. 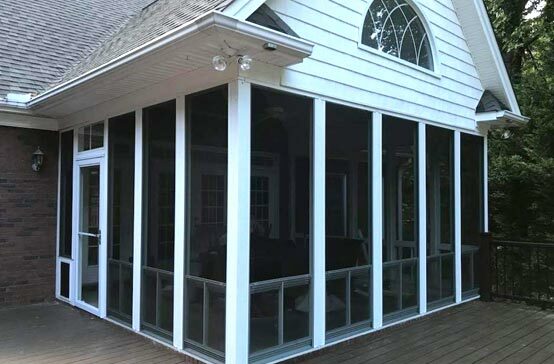 Screened-in porches let you enjoy the best of both worlds. Enjoy being outdoors while staying in the shade and away from those summertime bugs. 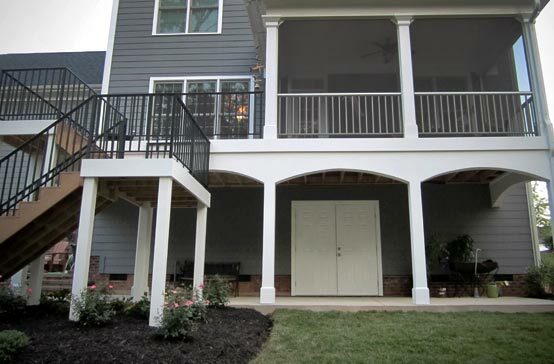 Our porch designs can be tailored almost as much as a room inside your home. Just tell us what features you want included and we’ll make it happen! Covered porches allow you to truly be outdoors without having to face the harsh rays of the sun. Add a small covered space to the front of your home or something larger in the back. We’ll create a design that blends seamlessly into the rest of your home. Pavilions are some of the most versatile covered structures around. Use them for entertaining or for shelter from the weather. We’ll work with you to come up with a design you’re sure to love. Sunrooms let you experience the beauty of nature while enjoying the comfort of the indoors. A 3-season room is sure to become one of your favorite spaces in your home. We’ll help you choose the perfect location based on the sun, along with the best materials for your needs. If you have a pool but don’t have a pool house, you don’t know what you’re missing! Adding a pool house or cabana to your home makes a real statement. You’ll gain shelter from the sun, a place to store outdoor furniture during the winter, and added value for your home.